This post is all about my updated skin care routine, as of February 2014. I have been using this routine for a couple months now, and I absolutely love it. It is a lot different than my previous routines that kept to a strict step by step system. While those are great for some skin concerns, I find that my skin, as well as the majority of peoples skin, is constantly changing and needing different things to keep it healthy. As of now, my skin type is acne-prone (mainly cystic), susceptible to dryness and irritation at times, and susceptible to concentrated oiliness at times. I have moderate to severe scaring left behind from previous breakouts, and moderately sized pores on my cheeks. Proactiv+ Skin Smoothing Exfoliator – is a thick cream with micro beads to exfoliate. It has 2.5% Benzoyl Peroxide, as well as glycolic acid. I think this is a great cleanser for both morning and night because it does a great job of cleansing the skin gently without over drying. It has a light medicinal fragrance, and rinses clean without leaving any residue on the skin. When my skin is being particularly good, or when it is extra sensitive and needs a break, I will only use this product for that day. La Roche Posay Effaclar Duo – is a dual action acne treatment that has 5.5% benzoyl peroxide, 0.4% LHA, and soothing flower extracts. It has a thin cream consistency with no fragrance. I prefer this treatment over the similar Proactiv+ Pore Targeting Treatment because it has a higher percentage of benzoyl peroxide as well as many other better ingredients. I typically apply this in the evening only to the areas of my skin that have active blemishes due to the fact that it is extremely potent and can cause irritation to my skin if over-applied. Proactiv+ Complexion Perfecting Hydrator – is a soothing gel/mousse moisturizer with 0.5% salicylic acid. I love this product because it is extremely soothing and leaves the skin looking and feeling healthier. It has a slightly medicinal scent with notes of cucumber and citrus. I use this in the evening after cleansing or cleansing and treating. Mario Badescu Drying Cream – is a thick, clay-like cream that is used as a spot treatment for acne blemishes. It contains ingredients like aloe, beeswax, lemon extract, and colloidal sulfur to quickly dry blemishes, even erupted ones! I like that this product is slightly tinted to conceal problem areas as well. I typically use this product when I have a stubborn blemish that needs to be dried out. Clinique Spot Healing Gel – is a concentrated 1.0% salicylic acid gel that is used as a spot treatment for acne blemishes. I use this product when I have a deep cystic blemish that needs a little extra help. Unfortunately this product is no longer available, so I will not ramble on about how wonderful it is. Kiehls Ultra Facial Moisturizer – is a gentle moisturizer that has a light milk and honey fragrance, and ingredients like sweet almond oil, apricot kernel oil, and avocado oil. Kiehls also has an identical product that contains an SPF, but I opted for this one so I can use it anytime for any occasion. I use this product every morning, and every time I apply makeup. Dior DiorSnow UV Sheild – is a translucent SPF 50 PA+++ moisturizing cream. It has the most luxurious feeling to the skin, and has a convenient pump applicator. I usually mix this in with my Kiehls moisturizer daily, but I also apply a proper coat to my entire face and neck when I know I will be in the sun all day. This product gives fantastic sun protection. Burts Bees Radiance Eye Cream – is a thick, hydrating eye cream that has ingredients like royal jelly ( which is “made of nectar, pollen, flower parts, vitamins, minerals, and other natural ingredients. It is a very precious, mysterious substance that honeybees produce for the queen bee”), cucumber, and chamomile. It has a strong smokey campfire fragrance that could be bothersome to people, but it does not bother me much as it dissipates fairly quickly. Vitamin E Oil – whenever I am not wearing makeup for the day, or have extra dry skin or dry patches, or want to pamper my skin, I apply vitamin e oil. It keeps my skin super soft, smooth, clear, and healthy, and I would recommend this to everyone. I use the Derma E Vitamin E Skin Oil 14,000 I.U..
Proactiv+ – http://www.proactiv.com , about $40 dollars for a three step system. My sizes are 6oz for the cleanser and 3oz for the hydrator. La Roche Posay Effaclar Duo can be found at drugstores like CVS and Ulta for about $36 dollars for 1.35oz . Mario Badescu Drying Cream can be found at Ulta for about $14 dollars for 0.5oz . Kiehls Ultra Facial Moisturizer can be found at : http://www.kiehls.com/Ultra-Facial-Moisturizer/351,default,pd.html?start=16&cgid=face-moisturizers , for between $18 and $38 dollars depending on the ounces you choose. DiorSnow UV Sheild can be found at Sephora for $58 dollars for 1.3oz . Burts Bees Radiance Eye Cream can be found at drugstores like CVS and Ulta for about $18 dollars for 0.5oz . Vitamin E Oil can be found anywhere that sells vitamins. I got mine at Sprouts market for less than $15 dollars for 2oz . Hey Everyone! Today I thought I would share an amazing product that I discovered for all skin types, but is especially great for problematic skin. I came across this product when researching detox bath recipes and such. What I ended up discovering turned out to be one of my holy grail skin products. Calcium Bentonite Clay has been around for years mainly used in bodywraps, foot soaks, bug bite salves, etc. Recently it has become more popular is treating skin problems such as acne. I was skeptical at first, but with some additional research I found that what makes it so powerful is the fact that the clay extracts and absorbs dirt, oil, and impurities without actually being absorbed into the skin itself. This means you can expect an extremely deep pore cleanse without any residual impurites. The calcium bentonite clay I am currently using is the Aztec Secret Indian Healing Clay, which claims to be the world’s most powerful facial. It is 100% calcium bentonite clay with no additives, fragrances, or animal products. It is also sun dried, and cruelty free! The instructions for use are to mix clay with equal parts of raw apple cider and/or water and stir in a non-metal bowl until it turns into a smooth paste. Then apply a 1/4 – 1/2 inch layer to the skin and let dry between 5 and 2o minutes depending on the sensitivity of your skin; then rinse with warm water. This product also warns that you will feel a pulling and tightening sensation, which is completely correct! It is not painful in any way, it just feels like your skin is getting pulled/squished forward towards the center of your face. It also will leave your skin a bit red for about an hour before turning back to normal. After a few hours, or the next day if you apply this mask before bed, your pores should have shrunken significantly and your face should look extremely smooth and matte. Usually the majority of any acne I have will have disappeared or at least reduced by a huge margin. I like to use this mask once every one or two weeks. I purchased mine at The Vitamin Shoppe for $4.99. In addition to using this product for facial masks, I also like to use it in detox baths. Hey Everyone! Today I’m reviewing the Clinique Acne Solutions regimen, as well as talking about my current skincare routine. For those of you who don’t already know, I’ve suffered from breakouts for the majority of my life and have since been on numerous different routines and treatments trying to solve the problem. Before I started the Clinique regimen, I was using the Neutrogena Skin ID system, which really helped my skin a lot, but they discontinued that line leaving me to have to find something else. Yes, I have been to dermatologists many times throughout my battle with acne, but I’ve found that when I use the harsh treatments they tend to prescribe I lose the health of my skin and end up having to quit using any kind of treatment and only use gentle cleansers and moisturizers to get it back to “normal”. That is why the majority of the time I prefer using non-prescription treatments. Now back to the review! Overall, I would give this system a 4/5. It was able to significantly clear up my skin extremely quickly without making it look and feel unhealthy. If you have heard bad things about Clinique products and are still weary, I would recommend getting a sample of the spot treatment first. If you like the spot treatment, you will love the rest of the line! Best “Lazy” Tip For Clean Skin!!! 1. Use a makeup remover wipe to get all of your face and eye makeup off. I use the Neutrogena makeup remover wipes. 2. Get a hot washcloth moderately to heavily soaked in water and place over your entire face. (kind of like at a spa facial) Do this until your face is steamy and your pores feel open. Then wipe off the excess makeup and residue with the washcloth. This should take way less than five minutes, which is way better than removing your makeup, cleansing, toning, treating, moisturizing, etc. which takes me about ten minutes each night (I’m very thorough). By doing these three steps, you’ll be cleansing your skin and prepping it to look good the next day ; instead of doing nothing and getting breakouts and makeup all over your pillow. The reason why this works so well is because of two things. One is that after you remove your makeup with a wipe, you prep it to accept treatment better by steaming the skin with a hot washcloth. The second is the actual ingredients in the Tea Tree Water toner. 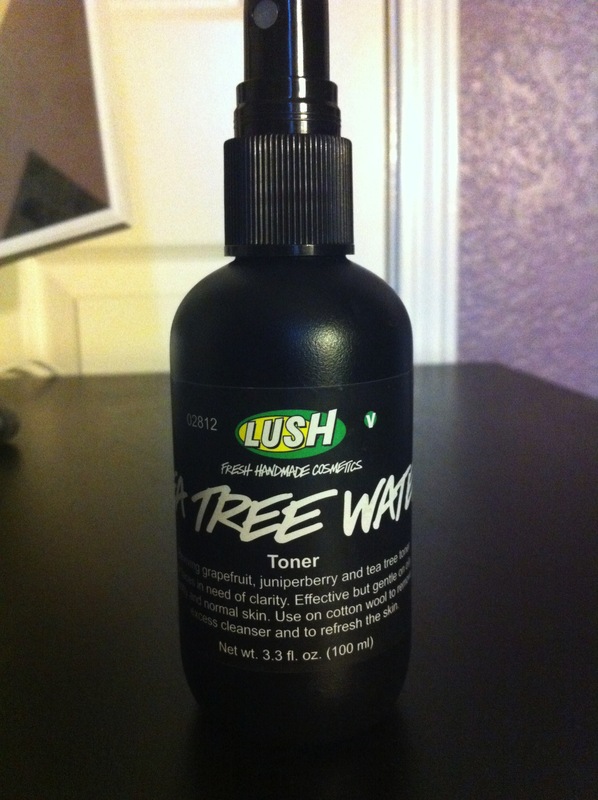 The three main ingredients in the toner are tea tree, grapefruit, and juniper berry. Tea tree is a natural antiseptic, antibacterial, and antifungal, which basically means its going to heal, protect, and clean any kind of blemish on your skin, as well as your skin as a whole. Not only is Grapefruit high in vitamin C (which is fantastic for the skin) but it is also an anti-inflammatory, which is skin calming and it increases pH levels to combat acne and balance oil levels. Juniper Berry is awesome for unclogging pores due to its detoxifying and astringent qualities. Please try this out the next time you’re too tired to properly take care of your skin and let me know what you think! Check out my video for more info!